It’s with a broken heart that I settle in front of my computer to write this column. I’d intended to update Iniesta’s condition, to report that she’s as good as new after her head-in-the-plastic-bucket mishap from a couple of weeks ago. But then something tragic happened. Sophie, the cutest dog in the whole wide world, died. The accident happened on a Friday afternoon while I was having dinner with my friend Sandy. A neighbor, Dexter, called to say that Sophie had been hit by the UPS truck. She looked to be hurt pretty bad. I made it home in less than five minutes and found several folks (but not the UPS driver) gathered round Sophie as she lay on the shoulder of the road. Her back legs were scraped and bloody but she was conscious and managed to raise her head and thump her tail a time or two when she saw me. I laid my face on the gurney next to Sophie’s and told her I’d see her soon. I stroked her velvety ears. “You’re going to be just fine, sweet girl,” I whispered. Sophie stirred a little and stared at me with those hazel eyes that looked like they were ringed with eyeliner. I kissed her snout and walked out to the parking lot. Now all I have left are tears and memories. Choosing Sophie as pick of the litter almost eight years ago. Puppy kindergarten. A road trip to the beach when she was only ten weeks old for daughter Leigh’s wedding. The way she terrorized squirrels and groundhogs. How she love to nap in the sun on cool mornings. Car rides of any length, including the short one from my mailbox to the garage. 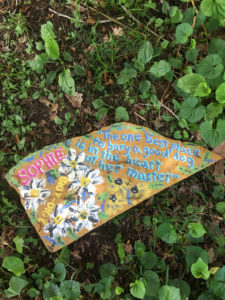 I try to take comfort in knowing that although our time together ended too soon, Sophie had an extraordinarily happy life. She died doing one of the things she loved best—chasing the UPS truck. I’m grateful that I still have Iniesta, who grieves along with me. Time—as it always does–will dull the pain, but it will never, ever erase my love for the cutest dog in the whole wide world.